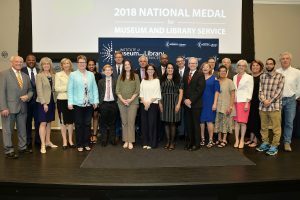 Over 140 library and museum professionals, government staff, and members of Congress joined the Institute of Museum and Library Services (IMLS) at their 24th National Medal ceremony on Thursday, May 24th in Washington, DC. This year, the IMLS began the day with panel sessions featuring medalists and moderators from the IMLS’ Board of Directors. Our first panel focused on ways museums and libraries have increased access to their communities, followed by a second panel that explored the ways these institutions are expanding the traditional roles of libraries and museums in unique ways. 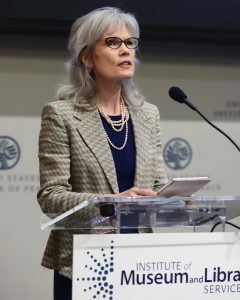 IMLS Director, Dr. Kathryn K. Matthew, emphasized that the medal winners represent the future of museums and libraries. They design programs that engage underserved populations and youth, break barriers of access to education, and encourage lifelong learning from childhood through the senior years. was proud to point out that the state of South Carolina is home to a number of IMLS medalists, including the Columbia Museum of Art and the Richland County Library. 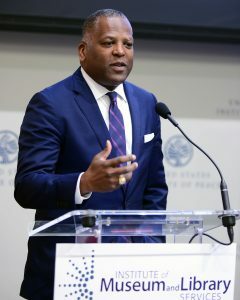 During his remarks, he underscored the power of learning and the innovative ways museums and libraries deliver education to their communities. Prioritizing inclusion in learning is shaping the future of our country and this responsibility cannot be understated. He urged the medalist to continue the important work that they’re doing to deliver education across all segments of the population. Through social media and a national press release, the IMLS promoted the livestreaming of this day-long program. Throughout the day, attendees and virtual participants were tweeting about the accomplishments of these remarkable medal winners. Capital Meeting Planning (CMP) was thrilled to manage the logistics for this extraordinary program. Holding an event at a secure facility presents a unique set of challenges. From bringing supplies into the building through a secure loading dock, to ensuring the smooth entry of nearly 150 attendees into a building with magnetometers, our staff worked hand-in-hand with planning and security teams at the USIP prior to the event to ensure that security would not be an issue on event-day. The panels and the ceremony were contained to one main auditorium which required a quick stage reset from a “talk show” style setup in the morning to an awards presentation setup with ample room for medalists to proceed across the stage. 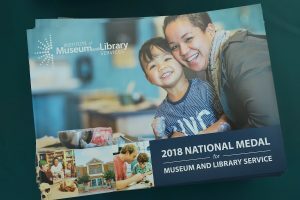 Due to the unique nature of an awards program, we worked with the IMLS to create a detailed run-of-show that included remarks, staging, cues, and staff roles. To ensure that everyone was on the same page, we conducted a rehearsal the night before allowing us to make minor changes to our stage instructions. This was a very high-profile event for the IMLS, and we are grateful that they entrusted us to manage the logistics.